Finally! I found something that “works” for me. And what a surprise – it is my old, beloved, little Borg 77EDII that I purchased in 2008 as my first ever refracting telescope for astronomical photography. At that time I haven’t ever thought the astrograph adverb – claiming it to be “well suited for full-frame (36mm) digital photography” important to me as my first imaging CCD camera was of a tiny chip (1/4”) and had only 0.4 megapixels . Since then I bought my second (1.4 megapixel), third (11 megapixel) and fourth (10 megapixel) CCD camera with 11mm (2/3”), 43mm (full-frame) and 28mm (APS size) diagonal of the CCD chip surface. Now it became important (actually I wouldn’t buy the full-frame CCD knowing my telescope is unable to make any use of it). There is one (at least) very important condition. You must have purchased a focuser upgrade to the best ever FTF (Feather Touch Focuser) made by Starlight Instruments and offered by Borg (Hutech) as a purchase option. At the time of my purchase I ordered focuser upgrade, but from the standard helical focuser, part #7835 having two securing thumbscrews to #7837 having three securing thumbscrews only which turned out to be insufficient for larger and much heavier CCD camera at later time. 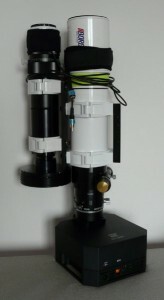 Nowadays there’s only an UFTF-M57 offer on focuser upgrade on the website which is for a very reasonable price. 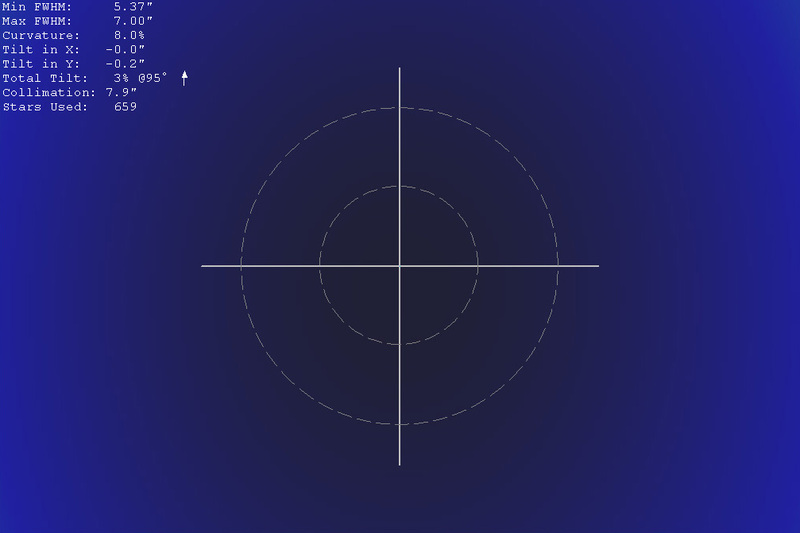 Next important requirement is to maintain correct backfocus – distance between the last optical element (back end) of the focal reducer and imaging camera CCD chip surface. 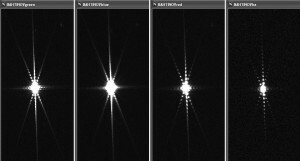 The distance depends on both the reducer backfocus specification (most commonly 55mm or 75mm with refractors or reflectors up to twice as long with Cassegrains) and the CCD camera chip distance from the camera head (front part with threads for attachment to the telescope) that depends on every particular model and differs from manufacturer to manufacturer. Borg offers some standard camera adapters to use for attachment of various CCD cameras to the F4 Super Reducer like STL adapter for SBIG STL thread equipped cameras. The Borg F4 Astrograph line, namely the 0.66x Super Reducer comes with front-end and rear-end spacers that allows its use with various front lenses – 77EDII, 101EDII or 125 which makes it quite modular. Check the first table on the Borg F4 Astrograph website. Unfortunately there’s still a bug in that table. The problem is only with 77EDII where the rear spacer is 4mm thick, not 2mm as stated on the website. To sum up the imaging train of my little 77EDII with F4 Super Reducer that ends with M49.8 threads I put the 4mm rear spacer then STL adapter and then I mount my CCD camera that is a Moravian Instruments G3-11000 CCD with PSB-1100 adapter which makes it essentially equivalent to any SBIG STL camera. The G3-11000 eats 29mm of backfocus, the PSB-1100 adapter some 11mm which results in 40 millimeters. I am using integrated filter wheel with a set of 50mm unmounted Astrodon filters that are 3mm thick which makes the effective backfocus (optical light path) 1mm shorter (39mm instead of 40mm). Another one millimeter takes the front optical window of the CCD camera which results in total of about 38.3mm of effective backfocus. All together it makes it a perfect match for the F4 Super Reducer. With my other CCD camera, Atik 314L+ I use following setup (along with the 4mm thick rear spacer): #7920 M49.8 to M57 AD, #7522 M57 to M36.4 /M42p0.75 T-thread Adapter, 1mm thick T2 spacer – now I am on 13mm of total optical and physical length, SXFW that has 29mm of backfocus, another 1mm T2 spacer and yet another easily removable 1mm thick T2 spacer and finally a CCD camera Atik 314L+ that has 12mm backfocus. Summing it up I get 56mm physical which is equal to 55mm optical length because I use 3mm thick Astrodon filters mounted in the filter wheel that shortens the light path by 1/3 of the filter thickness (and 1/3 * 3mm = 1mm which explains the yet another easily removable spacer in the path). 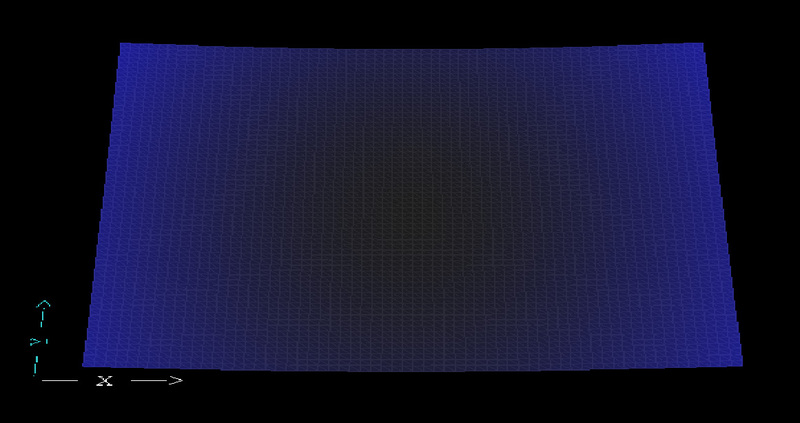 Let’s have a look at some plots and charts now. I hope the graphs are self-explanatory. 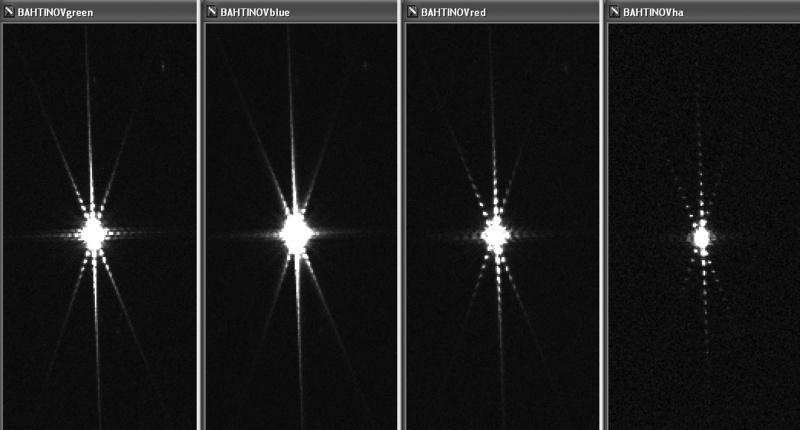 The vignetting is around 20-30% within 95% of the whole inner field of view and 30-40% maximum at the very edge (last 100 pixels in the corners). I would also like to show my latest image done with this setup – Borg 77EDII @ F/4.3, 330mm f.l., MII G3-11000 CCD with Astrodon 5nm Ha/OIII filters, Losmandy G-11 mount guided with miniBorg 50Achro and Atik 16ic, Czech Republic. Full size at 100% resolution can be seen here (Ha) and here (Ha/OIII). The performance of the Super Reducer mounted on 77EDII used with full-frame CCD camera shows that it is capable to achieve as small spots of the stars as 12um at the very edge of the large 36x24mm field in Hydrogen Alpha light (FWHM 1.3) and around 14.5um in Oxygen III light (FWHM 1.6) when precisely focused. On a smaller field of 11mm diagonal CCD chip I get about 7um spot in Hydrogen Alpha and Sulfur II light (FWHM around 1.1) and 8.4um spot in Oxygen III (FWHM around 1.2-1.3). 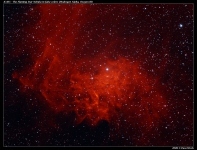 Concerning RGB imaging I am still a newbie as I am missing perfect sky without light pollution to take RGB images. Anyway, I have to admit, that there is noticeable chromatic aberration even though this Astrograph is 6 elements Petzval design where two of the elements are from ED glasses. The reason why it is so is obvious. At F-speed of F/4.3 the telescope can be said is a bit fast. At such a F-speed it is much harder (and much more expensive) to make high quality, top apochromatic lenses and that’s why a simple ED doublet from e.g. Sky-Watcher seems to have lower CA then Borg 77EDII. The Sky-Watcher 80/600 with 0.8x reducer is slow F/6 telescope versus F/4.3. This can’t be ever compared not mentioning that people show their images in 50% or 33% resolution and because color sensors (Bayer matrix) plays its role (loss of resolution and detail). Fortunately, there are at least two ways how to overcome the CA when imaging with a CCD camera. The first one, more obvious and working for monochromatic CCD, is to refocus every color separately (or refocus between Red/Ha/SII that has more or less the same focus position and L/G/B/OIII that noticeably differs). Following image shows the CA problem and a need of refocusing using a Bahtinov mask. It is one of my old tests where both the Green and Blue are by a hair unfocused (extra-intra focus) and the Red and Ha shows the shift between these two main focus positions. Last, but most important mean, how to fix the CA for today’s very demanding CCD cameras with small pixels (where everything matters and shows up quickly) is using an UV-cut filter. The problem with my top quality filters from Astrodon is that the maximum transmittance of the Blue (and Luminance) filters starts at very short wavelengths while also the sensitivity (QE, quantum efficiency) of today’s CCD detectors is relatively high in short, blue wavelengths and this causes a problem how to focus. 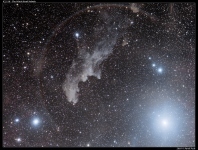 You may get large blue halos around stars and there’s no remedy to reach a sharp focus. The solution is to use UV-cut filter. I have good experience with IDAS LPS-P2 and Baader UV/IR cut filter (420-680nm) – item # 2459210A. These are essential for any RGB imaging (one of them). The spot sizes with small CCD vary from 8.4um for Red to 10.3um for Blue. On a very edge of a full-frame CCD camera I get 27um to 33um for the worst, Blue channel and 18um to 22um in the best, Red channel. Green is in between. To sum it up the Borg 77EDII is lightweight, compact, versatile imaging telescope that with FTF focuser easily holds even a heavy CCD camera and allows very wide shots of celestial objects. It allows for 48mm or 52mm filter attachment as the F4 SR has specific filter holder. 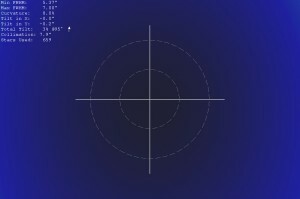 Also there’s a rotating ring that is a must have to call the system astrograph. Unfortunately I find the locking of the rotating ring the weakest part in order to achieve same spot size stars on both sides of the very large field of view of full-frame CCD camera (maintain the chip square to the focal plane). The only downside for going with Borg is that you end up with purchasing another and another parts to check out all the possible configurations and options this versatile system allows (and you spend a lot of money on it! ). Another “working” (for 36x24mm field) configuration of Borg Astrograph I know of is Borg 101EDII with 0.85x Reducer DGL. I also own a new 71FL lens but I am missing a working reducer for it. Maybe the new 0.7x Triplet Super Reducer will do the job. I hope at least! Moc hezka recenze a super fotky! P.S. : jiz jsem 1x testoval novy 0.7x triplet pro miniBorg 71FL na FF CCD kamere a zatim spokojenost 90% (mohlo by to byt lepsi).